The article ‘In wait for revamp’ (February 1-15, 2011) is bound to touch the hearts of science students in India who are forced by the prevailing conditions to take up job-securing courses. They are unable to pursue pure science research due to lack of patronage from governments and the private sector. School and college level science laboratories lack basic infrastructure to lay foundations of science in adolescents. Science graduates churned out by the thousands of degree colleges in the country see no future because of the weak foundation and lack of career opportunities. Students pursuing other disciplines have better career opportunities than those pursuing pure science. As a result, science students end up as schoolteachers and bank clerks. The education system is like an orphan child, whose basic needs are fulfilled but does not get quality upbringing. Even the famed Indian Institute of Advance Studies in Shimla, with crores of rupees of annual budget for research, does not have any science faculty. Instead of settling the raging controversy over GM food, especially Bt brinjal, the Inter-Academy update on GM crops has further confused the issue (‘Scientifically invalid’, January 16-31, 2011). The six self-contradicting recommendations reveal that the exercise was a failure. The arguments raised by the opponents are well balanced and more objective than those favouring GM foods. It is amazing how the experts in the Inter-Academy could bring out a document that is confusing and lacks basic data. The update fails to convince the scientific community and the general public that GM foods are “absolutely” safe for human consumption. The article ‘Will future cities be friendly?’ (February 1-15, 2011) accurately portrays the paradox of development projects criss-crossing our metros and small towns. 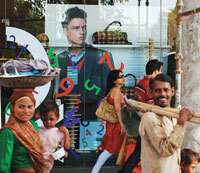 We have swanky malls, metro stations and air-conditioned buses plying on the bus rapid transit corridors. They surround cramped houses, narrow alleys, sidewalks and playgrounds that are shrinking rapidly. City developers blatantly ignore sustainability and availability of resources. In Delhi, for instance, most expansions are illegal. Rapidly mushrooming mini townships are glaring examples of how expansion policies are ignoring basic criteria like power, water supply, ventilation and availability of transport, all very crucial for sustainable living conditions. Huge malls and mini-townships built by encroaching builders next to slum areas in the name of development are an eyesore. Urbanisation is the need of the hour. But it should be based on the needs and demands and not on planners or builders. Development should be sustainable in respect to economic, social and cultural aspects. Any deviation from this concept leads to destabilisation. I have witnessed growth and development of Delhi, Kolkata, Mumbai, Bengaluru, Chennai and Hyderabad since 1980s. Sorry to say that the quality of life has deteriorated. Along with development, we have created urban slums, vulnerable to health hazards. Is this the kind of development we want? Interpretation based on remote sensing data is not an ultimate doctrine to support or disprove glacier retrieval or progress (‘Melting uncertainty’, February 16-28, 2011). Himalayan glaciers have a large amount of black carbon that reduces the albedo or reflection coefficient of ice and enhances melting. The glacial moraine also contains large volume of black carbon deposited during and after snowfall. Substantial amount of black carbon is generated from villages in higher Himalayas as well as from the towns at the foothills. For instance, Leh, the capital of Ladakh, meets its electricity demand from diesel generators. It burns three million litres of diesel to get about 8 MW of electricity. Assuming 0.84 gramme per litre (g/L) of black carbon emission from diesel, the fuel alone contributes 2.5 mega grammes of black carbon to this pristine Himalayan environment. This could be higher because combustion of diesel is incomplete at an altitude of 4.5 km. In fact the black carbon emission in Leh will be much higher if other sources like use of biomass and dung for cooking and heating homes during winters are also considered. All these emissions get deposited along with the snow. Ice cores recovered from Rongbuk glacier, in southern Tibet, contain about 20 mg/kg of black carbon. The global average is 5 mg/kg. All that farmers want is an assured income and protection from erratic weather (‘Farmers want support’, February 16-28, 2011). Crop insurance should cover destruction due to erratic weather. The government should provide special storage facilities for fruits and vegetables in villages and proper transport facilities. Research plays an important part. The government should convert all the pump sets to solar-powered ones. The agriculture budget should be prepared after consultations with farmers and their organisations. At present 333 sponge iron factories produce 29.2 million tonnes per annum of iron (‘Neo iron age’, January 16–31, 2011). The ministry of steel plans to increase the number of factories to 431. The question is: why is India adding these polluting industries instead of setting up integrated steel plants where pollution control could be more effective even though it might lead to displacement and rehabilitation of people. The government should rather adopt the latest technology to control pollution and ensure energy efficiency in the production of steel. 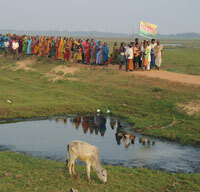 Encroachment of common land is a common practice in villages of India (‘Return of village land’, February 16-28, 2011). A village in Hisar district of Haryana has lost most of its common land due to encroachment. But I doubt there will be any complaint against encroachers as rich and influential people are involved. An increase in land price has also triggered the problem. Theft of common land in the UK is still fresh in our memory. We lost thousands of acres of commons during the enclosure movement in the 18th and 19th centuries. The movement was used to take away the traditional rights of mowing meadows for hay or grazing livestock. Recently, The Open Spaces Society, Britain’s oldest national conservation body, was able to reverse a government decision to sell publicly owned forest estate. It is an important victory for us. 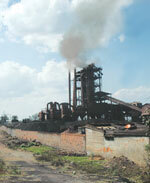 The environmental and social cost of the POSCO project in Odisha’s Jagat­singhpur district outweighs the economic gains to be made by the company and the state government (‘POSCO gets green signal’, February 16-28, 2011). The project will destroy livelihoods as the government will give away land to the South Korean multinational. The project has already marginalised people rather than bring employment opportunities. Such a modernisation project along the Odisha coastal belt is a neoliberal dream. The weather variables that cause drought, rains and floods are not new. It is the government and agencies unpreparedness that causes misery to the farmers (‘Bitter harvest: farmers kill selves’, February 1-15, 2011). Agriculture universities and research institutes claim to have developed drought or cold-resistant varieties of crops. Varieties that can withstand waterlogging when rains inundate the fields are also available. Then why are these not available to farmers? Making such varieties available in sensitive areas can help avoid suicides. Researchers and seed companies have a great role to play in addressing calamitous situations in the agriculture sector. Do mobile phone towers affect bird migration (‘Warning signal’, January 16-31, 2011)? As a schoolboy I used to keep pigeons and found that the birds released took longer to find their way back if there were radio transmitting stations in their flight path. Years later, I came across an article which mentioned that similar observations were made in England and Japan. There must be “electronic smog” in many parts of the world today. I would appreciate any latest information available on this subject. Cell phones have become so common that even schoolgoing children use them. Parents love to watch their toddler’s reaction while talking to them on cell phone. If they are aware of the radiation risk they will think twice before pressing a mobile against their toddler’s ears. Removing batteries from municipal solid waste and streaming them into recycling might reduce the toxic impacts, but battery recycling is not environmentally benign (‘Power & precision’, February 16-28, 2011). Scientists explain that there is significant transportation and related fuel costs to get batteries to recycling facilities and sort them into chemically related classes of materials. Battery recycling processes also require significant amounts of energy. It takes six to 10 times more energy to reclaim metals from batteries than by other means. Some batteries contain toxic metals such as cadmium, mercury, lead and lithium. These are hazardous waste and pose threats to health and the environment. Manufacturers and scientists are working towards producing designs that contain fewer toxic material. I think it's a shame science students end up wasting their studies because of the lack of job opportunities in their domain, every country is needing scientists in order to develop and they shouldn't be ignored like this. Some of them should pursue a master in public health though, they could use their skills to find new cures and medicines, I am sure they have more chances to find a job if they do so.